The 911 Sport Classic is designed to showcase the bespoke skills of Porsche Exclusive, Stuttgart's do-anything-for-anyone personalisation division. It has added the new double-bubble roof to the wide-body Carrera S bodyshell, and that ducktail rear spoiler archly echoes the 1973 RS 2.7's iconic rump. 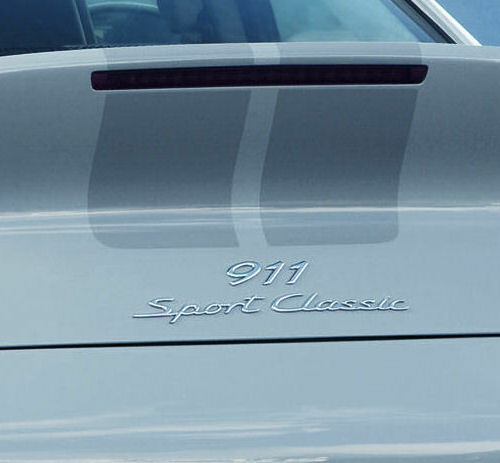 What about the tech changes on the 911 Sport Classic? It's a rear-drive Carrera S foundation, so you get the regular 3.8-litre direct-injection flat six – but fettled some. There's a new resonance intake manifold with six vacuum-controlled switching flaps – enough to raise power by 23bhp for a 408bhp total. Porsche's six-speed manual gearbox is standard-fit, while the PCCB ceramic brakes are part of the package. The Sport Classic sits 20mm lower on its sports suspension pack and those 19in alloys are custom-made and identifiable by their black-painted rim. Porsche Exclusive has thrown its full gamut of Harry Potter magic dust over the Sport Classic's cabin. The designers have let their hair down and trialled some novel materials, including leather strips woven with yam for the seat fabric. We're not quite sure what was wrong with Porsche's perfectly tasty conventional hides, but there you go. There is one big stumbling block, however. The 911 Sport Classic will cost an eye-watering £135-140,000 (tbc). Perhaps those yam should've been left behind on the famer's market stall. 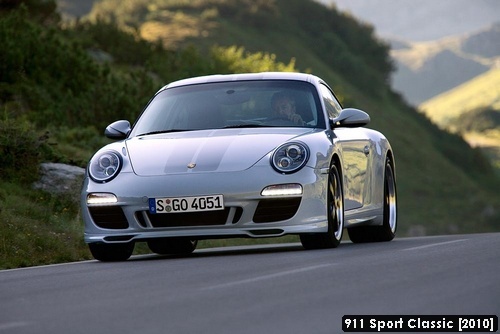 The new 911 goes on sale in January 2010, after its debut at the 2009 Frankfurt motor show. Dr. Ing. h.c. F. Porsche AG, Stuttgart, has refined the DNA of the 911 to what must be the most supreme standard of class and style in the 911 Sport Classic available to a strictly limited number of very special 911 enthusiasts. Creating this unique model, Porsche is bringing back the tradition of exclusive small series built in very small numbers. 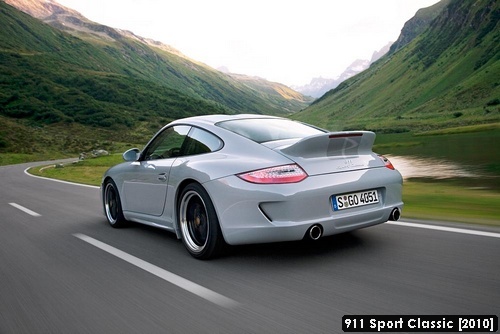 The 911 Sport Classic will be presented at the 2009 Frankfurt Motor Show and is limited in production to just 250 cars. This very special 911 from Porsche Exclusive has been developed over a project period of about three years, with lots of love for detail, catering especially for the most demanding group of genuine aficionados. 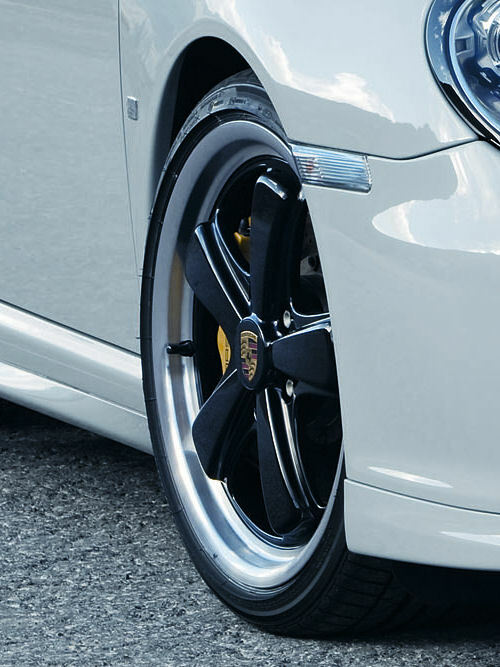 Porsche Exclusive is Porsche’s Specialist Department for the most outstanding customised versions of Porsche cars going beyond even the highest standard of the Company’s regular production models. The unique character of this very special 911 comes out at very first sight in the newly developed double-dome roof. A further highlight of this sports car based on the rear-wheel-drive Carrera S is the wider rear body up by 44 millimetres or 1.73" and the wider track on the rear axle. The striking SportDesign front apron with its unique spoiler lip and the rear spoiler fixed in position like the legendary ducktail on the 1973 Carrera RS 2.7 round off the unmistakable look of the 911 Sport Classic. Power comes from Porsche’s 3.8-litre with Direct Fuel Injection, increased in this case, also through the introduction of a newly developed resonance intake manifold with six vacuum-controlled switching flaps, by 23 bhp to 408 horsepower for even more outstanding performance. 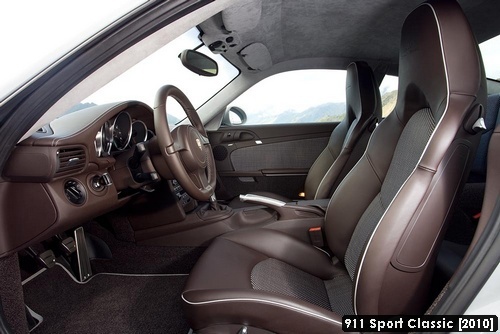 The 911 Sport Classic comes exclusively with a six-speed manual gearbox. PCCB Porsche Ceramic Composite Brakes ideally reflecting the sporting character of this exclusive 911, PASM sports suspension lowering the entire car by 20 mm or 0.79”, as well as the mechanical rear axle differential and custom-made 19-inch wheels with their rim star painted black all come together to offer a perfect match for the character of this most exclusive car. The very special, highly sophisticated interior of the 911 Sport Classic bears powerful testimony to one of the core competences of Porsche Exclusive and is characterised by new materials never used before even by Porsche. One example is woven leather made up of smooth leather strips and woven yarn featured on the seat centrepieces of the newly designed adaptive sports seats complete with light-grey piping and on the door panels. The dashboard including a wide range of inserts and add-on components is finished in Espresso Nature natural leather, providing a distinctive contrast to the exclusive body paint in Sport Classic Grey. Marking the introduction of this special limited edition model, Porsche Design Driver´s Selection is likewise introducing a range of new and very special products at the Frankfurt Motor Show. The limited edition AluFrame Trolley as well as a polo-shirt, a cap and a personalised lanyard take up the colour concept of the 911 Sport Classic, and in good time for the introduction of the new car a top-quality 1:43 model will also be available. 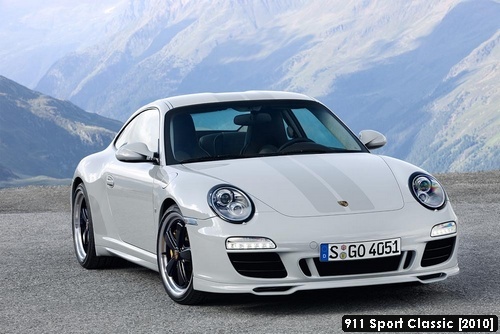 Sales of the Porsche 911 Sport Classic are starting in January 2010. I've seen elswhere that it will cost 'just' £135k, not £171k. Seam a bit pricey at £170k. Who in their right mind would pay that much for it?! Looks gorgeous but 100k is a bit too much for 20bhp and a ducktail spoiler! Won't be long before the Ducktail Spoiler is available to buy separately. It still has the naff "will rust in a week" wheel bolts I see!! although an EVEN closer look at the roof reveals a bit more in the form of new aero roof ! Alwasy thought they should do something like this, would love to see a GT3RS WITHOUT big spoiler, that wide end reminiscent of the supersport/widebody specias we love. Liking the Fuchs style wheels. As others say price is stupid, may as well DIY. the 993 Twin Turbo of only circa a dacade ago was about this with 2 turbos! 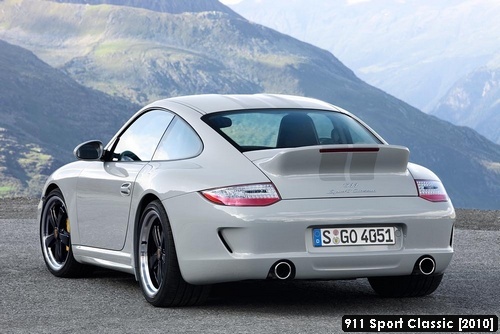 Everybody seems to have missed an important detail - it's the first 911 with a 911 badge since the 911SC. presumably this powerhike will be available as a power kit? I think the exhaust sounds great. To my ears, it sounds different (deeper) than the sports exhaust. Of course it could just be the recording. 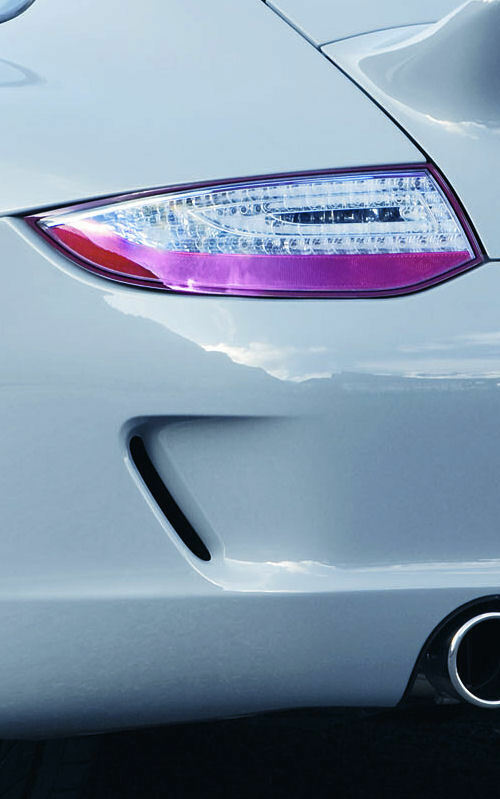 I also like the simpler look of the twin exhaust tips. I never understood the false quad tips when there are only 3 cylinders per bank. I wonder if the new induction system could be retrofit - probably too expensive. They do them for a 964, so 993 fitment is almost the same?